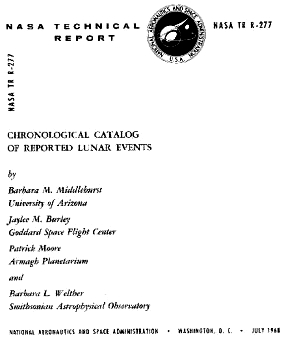 The Catalog ref.NASA TR R-277 released in 1968 was at that time the single most complete listing of all observed lunar anomalies that were recorded by observers from 1500 until 1967. This book refers to over 450 years worth of notes recording observations of unique or unusual phenomena seen on the lunar surface. They include reports of seeing areas on the moon's surface with strange colors, streaks of light, the appearance of mists, or even possible volcanic activity. The total number of unique (witnesses) observers is over 300 persons. The visible temporary lunar surface aberrations recorded down through the centuries total over 570.